Memorial Day originally called decoration day was to honor the men and women who served in the armed forces after the civil war. There are a lot of activities and it has become a holiday to remember those who have gone before use. But in the spirit, of the origin to remember those who gave the ultimate price for their country, we at Dogs Day Inn LLC dog boarding would like to remember those fallen canine that server our military and police in many capacities. These highly trained dogs give up their lives in a variety of ways and are not always treated with the respect that should be bestowed The serve with out complaining ready to as trained and will gladly give their life for their handler. Military and Law Enforcement dogs have been around since the earliest of times, and its time they are honored along with our military men and women. Many of our dogs in service die with no fanfare and little remembrance, the men and women that serve with them sometimes deeply troubled by their partner’s death. 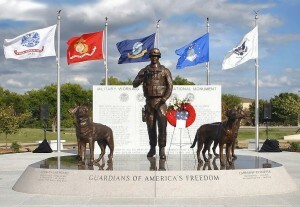 So if you can visit the Military Working Dog Teams National Monument at Joint Base San Antonio – Lackland, Texas dedicated last year to our fallen canine. Please make a donation to help the cause if you can, and check out their website.